Stuart Knechtle, MD, a leader in the field of liver transplantation, has joined the Emory Transplant Center as director of its liver transplant program, effective July 16. Knechtle will be a professor in the Department of Surgery in Emory University School of Medicine. Knechtle has been the director of liver transplantation and transplant clinical trials at the University of Wisconsin, Madison since 2005. He led a team that performed Wisconsin’s first liver transplant from a living donor and the state’s first combined liver/pancreas transplant. “We are proud to have a nationally recognized surgeon with a record of achievement in both research and quality patient care join our liver transplantation program,” says John Fox, president and CEO of Emory Healthcare. Knechtle says the importance of building a strong team for success in transplant surgery is a top reason to come to Emory. Knechtle says that he plans to build Emory’s liver transplant program by collaborating with colleagues in the departments of medicine, radiology, anesthesia and surgery. His research, in human clinical trials and in non-human primate models, focuses on tolerance, or how to avoid rejection of the new organ by the transplant recipient’s immune system. "What Stuart brings us is a team approach, an outstanding record in monitoring patient outcomes and close attention to improvements in the transplant process," says Christian P. Larsen, MD, PhD, director of the Emory Transplant Center. 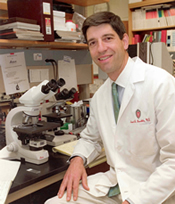 Knechtle obtained a biochemistry degree from Princeton University in 1978 and received his medical degree from Cornell University Medical College. He continued his education as a resident in surgery and research fellow in transplant immunology at Duke University and as a transplant fellow at the University of Wisconsin. He is on the editorial board of several national academic journals, including Transplantation, Transplant Immunology, and Annals of Surgery, and is co-editor-in-chief of Transplantation Reviews. With Peter Morris, he was co-editor of the textbook Kidney Transplantation: Principles and Practice. In 1999, Knechtle founded Renovar, a Wisconsin-based biotechnology company that specializes in diagnostic tests for kidney diseases. He remains Chairman of the Board and Chief Scientific Officer.